Jaguar was purchased by Ford in 1989 making this a Ford Motor Company product (thats how I justify it anyway since I am a die-hard Ford fan). 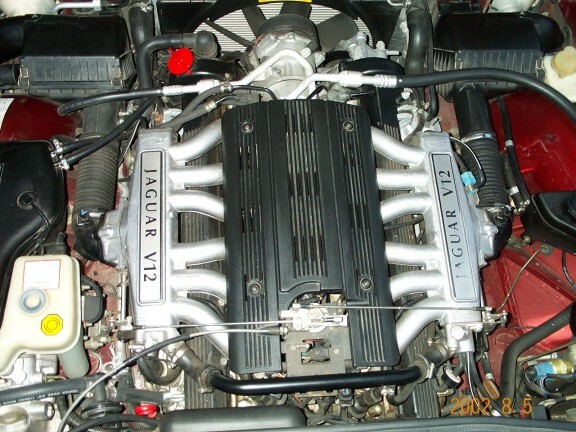 This was built near the end of the Jaguar V-12 era. It has the XJ40 body and is one of the few XJ12's with that body. The large rectangular Hella headlamps are unique to the XJ40 and work exceptionally well I might add. It has a 6.0L (366CID), SOHC, V12 engine rated at 308hp at 5350rpm and 336ft*lb at 3750rpm stock. This engine is glass-smooth from idle to redline and it has a very flat powerband. In stock form, it will accelerate the 4450lb car form 0 to 60mph in 6.8 seconds and run the quarter in 16 seconds flat. Not a race car but it does perform very well for a family cruiser. The 6.0L was a big step up from the older 5.3L Jaguar V12 in terms of power and torque. The top speed is (unverified by me, yet) 155mph electronically limited. So far I have not come across an opportunity to run it that fast but I do know there is plenty of throttle left at 100mph. The car is a pleasure to drive. The faster you go, the more fun it is. As far as mods go, I don't plan any major ones in the near future. The first thing I did was properly configure and adjust the complex throttle set-up so full throttle could be achieved. When I purchased the car, it would only go about 3/4 to 7/8 open with the pedal to the floor. The adjustments made a big difference. My first thought on modifications was a pair of turbos. The engine has 11:1 compression and very little space under the hood so forced induction would be very challenging. I already installed a pair of K&N high flow air filters (part# 33-2003, $39 each) and modified the airboxes for improved flow while still drawing air from a cool source. I have considered Extrude Honing ($900) the intake manifolds which is supposed to improve flow 20%. I still have some testing to do to figure out where the best areas for improvement are. There is an exhaust header kit and performance intake manifolds and throttle bodies available. The car also has 5 mufflers and I have heard that replacing the front 2 with pipes can help. I just can't leave anything bone stock. Luckily the car has the factory sports pack suspension and I am pretty happy with that. I would not want to drop the car any further. I made a couple runs with a G-Tech and here is what I got: 0-60mph in 6.33s, quarter mile was 14.67s @ 100.6mph. Using basic math, I estimated the current power to be around 330HP at the flywheel. A set of gears would really help this car out. It is a bit long-legged and heavy for drags. Traction was also a problem when powerbraking from a stop. The tires would fry (and these are Michelin Pilots) about half way through first gear. Now I upgraded to Michelin Pilot Sport A/S tires with a W speed rating. There is more information about Jaguars at the Jag-lovers website including brochures, specs, articles, and links to Jaguar related websites. The V12 engine fills the entire engine bay leaving little room for forced induction. The battery is trunk mounted, likely due to insufficient space under the hood (oops, I mean bonnet). As you can see from the graphs (which are metric), the torque curve is fairly flat. Plenty of torque right off idle and it carries it well to 5000rpm. After that it starts to fall off. To me, this shows serious potential for big power gains at the top by improving flow. Opening up the intake and exhaust would boost the torque curve especially in the 4000rpm to 6000rpm range. The engine has a 78.5mm stroke which is plenty short to allow some high rpm range. Since it does not have a mass air fuel control system, modifications could get tricky.